In order to obtain your Student Card (SC) you need to upload an appropriate photo at the incoming registration online and make the payment of 17 zl to your personal bank account on your arrival. You will get the number of the account as well as the SC itself from your Erasmus Faculty Coordinator. The SC entitles you to have many discounts, lower fees and other privileges. The SC also serves as your Identity Card (ID) in Poland whenever you are asked to confirm your name, nationality and the status of AMU student for example. With your SC you are allowed to check out books at the library. As a student of our faculty you are able to borrow books from the Faculty Library in Kalisz, as well as Main University Library in Poznań and all the other libraries in Poznań. In order to do so please bring your student card to the Faculty library at Nowy Świat 28-30 and register. Incoming Erasmus students submit and complete their “original” LA when registering online at http://incoming.amu.edu.pl. 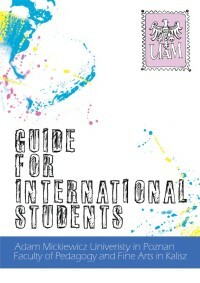 Erasmus Mundus incoming students receive the suggested LA form via email. You need to fill in the details at the beginning of the document-your name and your school. Then, print it and sign in the space provided under the table which lists the LA subjects for you to study during the winter and spring semesters 2013/2014. There, under this table, there is also a place: sending institution, this is the space for your Erasmus Coordinator and your school's representative signature and stamp. The host institution is us, our university, and will be signed after your arrival to Kalisz. There's one more table-changes to LA, but this table is completed by you after you have come to Kalisz in October. You don't need to post your LA, just scan and email the signed form. Then, bring the original over with you when you come to Poland. It is possible to change subjects on your arrival at our Faculty. You will receive a classes schedule and a list of all subject available in English to choose from. You will have a grace period of one week to decide on the subjects you wish to study. When you come to Kalisz and decide about the courses, you need to remember that your Erasmus ECTS points must total 30 per semester and 60 per whole academic year. Your Learning Agreement (or "changes" to it) needs to be signed by the Faculty Coordinator and the Faculty Dean. While establishing your syllabus you can choose from almost all the courses offered at English Philology Department and from those available in English at Fine Arts studies at the Faculty of Pedagogy and Fine Arts (WPA) in Kalisz. The Faculty Erasmus Coordinator will help you to find the courses you are most interested in. Before the examination period you need an Examination Card / Karta egzaminacyjna. You can pick it up at the faculty coordinator's office or it will be mailed to you before the semester examination period starts. Please have all your grades written down in the card and signed by the teachers and bring it to the coordinator. On the basis of this card your Transcript of Records will be issued by the coordinator. AMU examination periods are the first two weeks of February and the last two weeks of June (see the Calendar for exact dates). At the end of each university term and at the end of the full academic year you are obliged to obtain grades for each course you take. Also some courses terminate in exams (this applies to English Philology incoming students only) at the end of winter and/or spring term (there are only 2 semesters at our university and two exam periods). You need to pass the exams here in Kalisz. Before you leave Kalisz you will receive a Transcript of Records (=your grades), only the pass grade for a course entitles you to be awarded ECTS points. Thank you for choosing our Faculty as your Erasmus destination. We hope that your studying here will be a valuable and enjoyable experience.